From the Canyon Edge: Getting Started with Ubuntu Orchestra -- Servers in Concert! 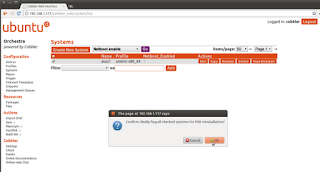 Getting Started with Ubuntu Orchestra -- Servers in Concert! Ubuntu Orchestra is one of the most exciting features of the Ubuntu 11.10 Server release, and we're already improving upon it for the big 12.04 LTS! I've previously given an architectural introduction to the design of Orchestra. Now, let's take a practical look at it in this how-to guide. To follow this particular guide, you'll need at least two physical systems and administrative access rights on your local DHCP server (perhaps on your network's router). With a little ingenuity, you can probably use two virtual machines and work around the router configuration. I'll follow this guide with another one using entirely virtual machines. To build this demonstration, I'm using two older ASUS (P1AH2) desktop systems. They're both dual-core 2.4GHz AMD processors and 2GB of RAM each. I'm also using a Linksys WRT310n router flashed with DD-WRT. Most importantly, at least one of the systems must be able to boot over the network using PXE. 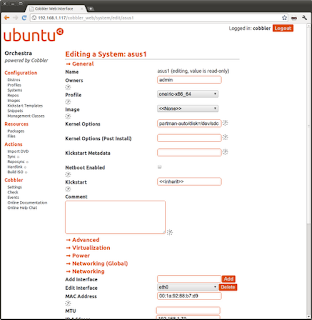 You will need to manually install Ubuntu 11.10 Server on one of the systems, using an ISO or a USB flash disk. 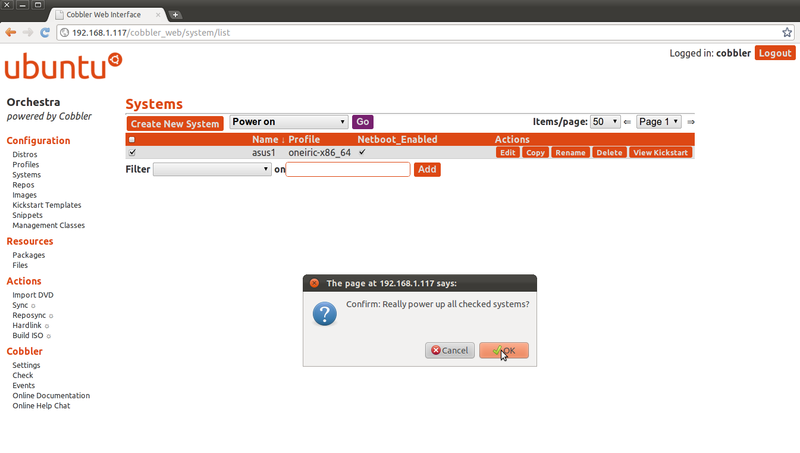 I used the 64-bit Ubuntu 11.10 Server ISO, and my no-questions-asked uquick installation method. This took me a little less than 10 minutes. After this system reboots, update and upgrade all packages on the system, and then install the ubuntu-orchestra-server package. You'll be prompted to enter a couple of configuration parameters, such as setting the cobbler user's password. It's important to read and understand each question. The default values are probably acceptable, except for one, which you'll want to be very careful about...the one that asks about DHCP/DNS management. In this post, I selected "No", as I want my DD-WRT router to continue handling DHCP/DNS. However, in a production environment (and if you want to use Orchestra with Juju), you might need to select "Yes" here. 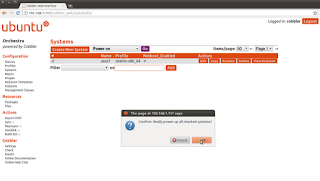 And a about five minutes later, you should have an Ubuntu Orchestra Server up and running! Once your Orchestra Server is installed, you're ready to prepare your target system for installation. You will need to enter your target system's BIOS settings, and ensure that the system is set to first boot from PXE (netboot), and then to local disk (hdd). Orchestra uses Cobbler (a project maintained by our friends at Fedora) to prepare the network installation using PXE and TFTP, and thus your machine needs to boot from the network. While you're in your BIOS configuration, you might also ensure that Wake on LAN (WoL) is also enabled. Next, you'll need to obtain the MAC address of the network card in your target system. One of many ways to obtain this is by booting that Ubuntu ISO, pressing ctrl-alt-F2, and running ip addr show. Now, you should add the system to Cobbler. 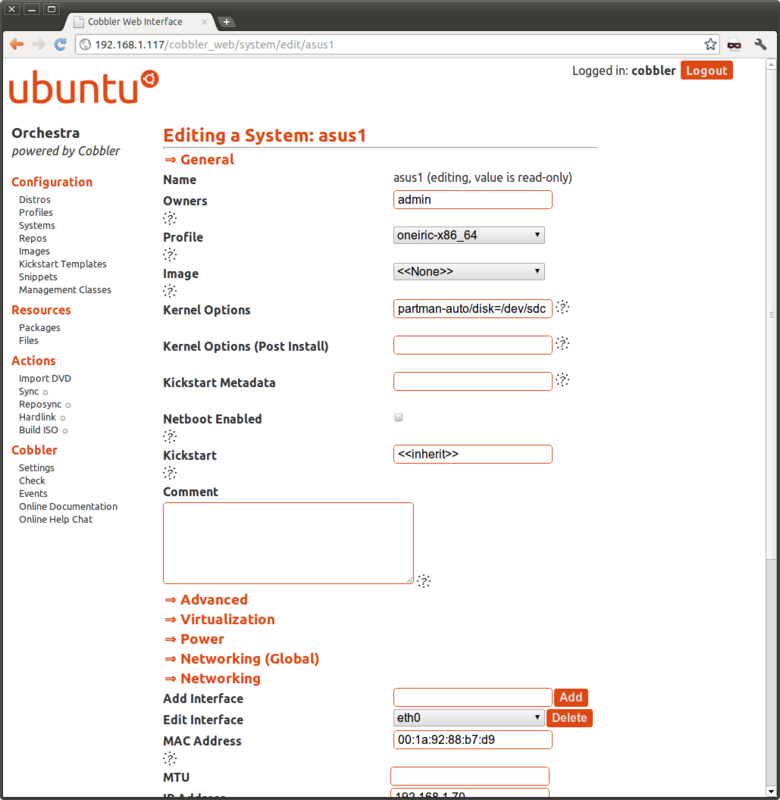 Ubuntu 11.10 ships a feature called cobbler-enlist that automates this, however, for this guide, we'll use the Cobbler web interface. Give the system a hostname (e.g., asus1), select its profile (e.g., oneiric-x86_64), IP address (e.g. 192.168.1.70), and MAC address (e.g., 00:1a:92:88:b7:d9). In the case of this system, I needed to tweak the Kernel Options, since this machine has more than one attached hard drive, and I want to ensure that Ubuntu installs onto /dev/sdc, so I set the Kernel Options to partman-auto/disk=/dev/sdc. 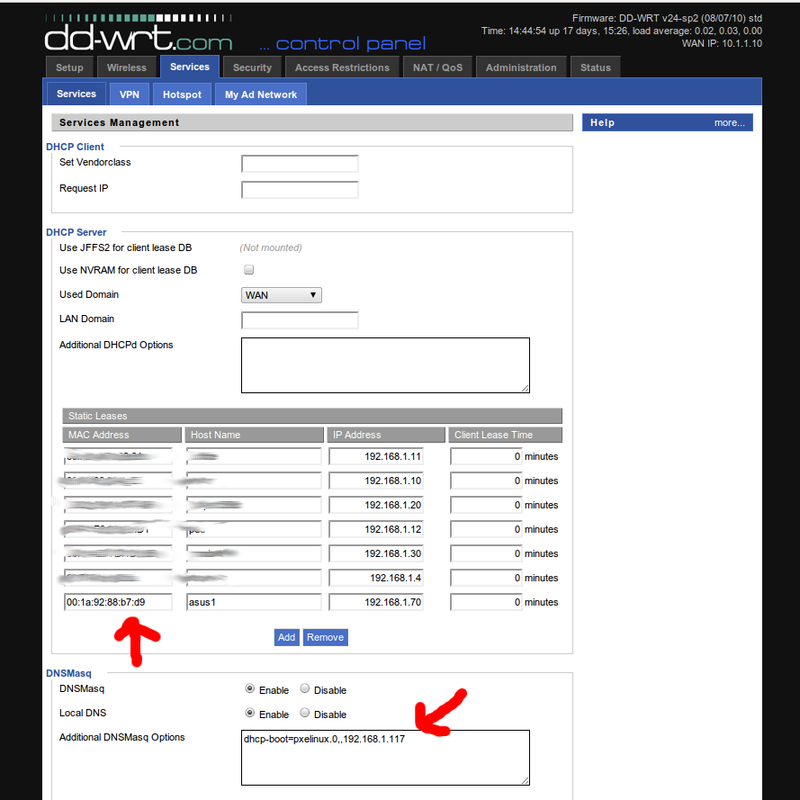 You might have other tweaks on a system-by-system basis that you need or want to adjust here (like IPMI configuration). Finally, I adjusted my DD-WRT router to add a static lease for my target system, and point dnsmasq to PXE boot against the Orchestra Server. You'll need to do something similar-but-different here, depending on how your network handles DHCP. All set! Now, let's trigger the installation. In the web interface, enable the machine for netbooting. If you have WoL working for this system, you can even use the web interface to power the system on. If not, you'll need to press the power button yourself. Move back and forth between splits with shift-F3 and shift-F4. The ccze command colorizes log files. syslog progress of your installation scrolling by. 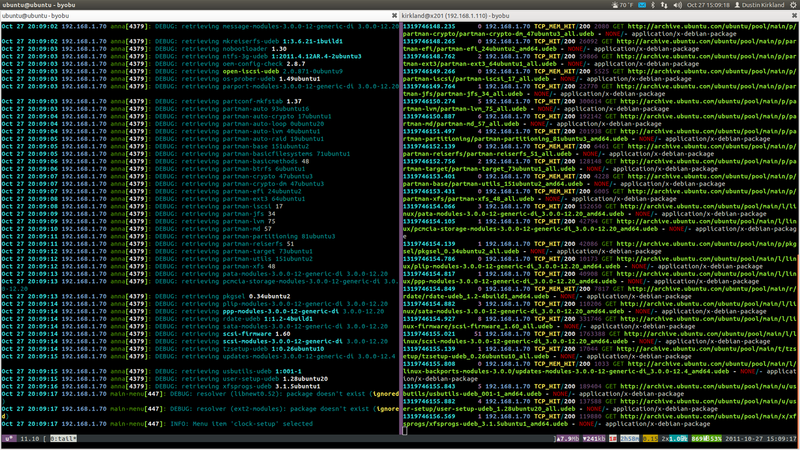 In the right split, you'll see your squid logs, as your Orchestra server caches the binary deb files it downloads. On your first installation, you'll see a lot of TCP_MISS messages. But if you try this installation a second time, subsequent installs will roll along much faster and you should see lots of TCP_HIT messages. It takes me about 5 minutes to install these machines with a warm squid cache (and maybe 10 mintues to do that first installation downloading all of those debs over the Internet). More importantly, I have installed as many as 30 machines simultaneously in a little over 5 minutes with a warm cache! I'd love to try more, but that's as much hardware as I've had concurrent access to, at this point. Most of what you've seen above is the provisioning aspect of Orchestra -- how to get the Ubuntu Server installed to bare metal, over the network, and at scale. Cobbler does much of the hard work there, but remarkably, that's only the first pillar of Orchestra. What you can do after the system is installed is even more exciting! Each system installed by Orchestra automatically uses rsyslog to push logs back to the Orchestra server. To keep the logs of multiple clients in sync, NTP is installed and running on every Orchestra managed system. 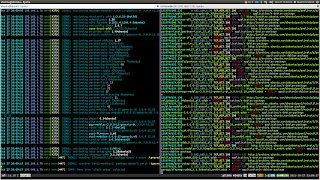 The Orchestra Server also includes the Nagios web front end, and each installed client runs a Nagios client. We're working on improving the out-of-the-box Nagios experience for 12.04, but the fundamentals are already there. Orchestra clients are running PowerNap in power-save mode, by default, so that Orchestra installed servers operate as energy efficiently as possible. Perhaps most importantly, Orchestra can actually serve as a machine provider to Juju, which can then offer complete Service Orchestration to your physical servers. I'll explain in another post soon how to point Juju to your Orchestra infrastructure, and deploy services directly to your bare metal servers. I won't be able to offer support in the comments below, but if you have questions or comments, drop by the friendly #ubuntu-server IRC channel on irc.freenode.net, where we have at least a dozen Ubuntu Server developers with Orchestra expertise, hanging around and happy to help! Will Ubuntu support Eucalyptus in future? a pull would be better. Is there any way to use orchestra if PXE is not an option? Lets say you have bare metal servers in different datacenters. Can you manage them using Orchestra? i have the same question as gabriel. i'm trying to test this out for future use, but i don't have a sealed network, so i can't change dhcp. 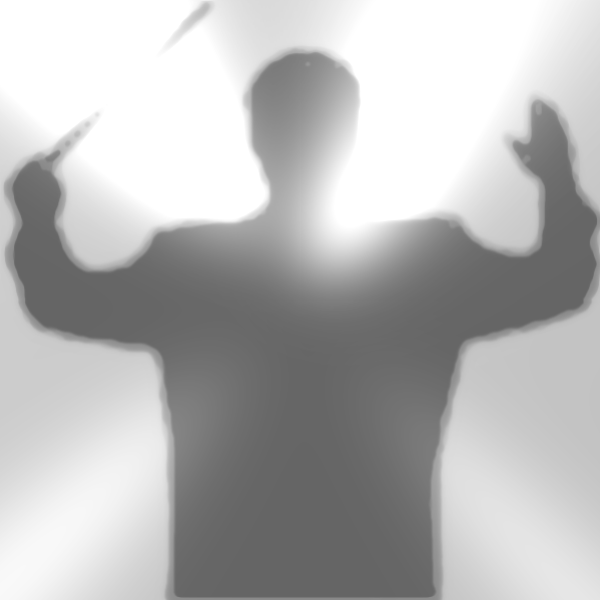 how can i point something at the orchestra server and have it go? documentation on this is nonexistent! a lot of stuff from people showing the steps i've done, then a big gap where the magic goes....i've got an orchestra server...but no magic.